Inspired by Paul's dare, I decided to take some pictures of my home office. Unlike Paul's digs, I've decided to be tortured by comfort. 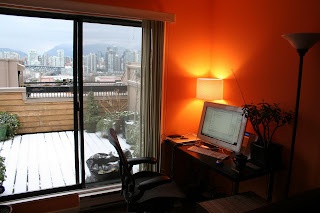 That's the view north from my deck of Yaletown and the north shore mountains. Yaletown has seemingly doubled the number of high rises in the past 5 years. 5 years ago, somebody told me it was the highest density neighborhood in North America. 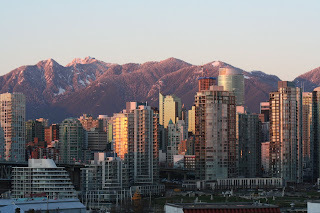 I haven't been able to confirm that fact, but it has a population density approximately 2.5 times that of Vancouver and Vancouver has the 4th highest population density in North America (after New York City, San Francisco, and Mexico City. Apparently we're on track to be number 2 by 2021. No wonder our tiny little townhouse cost so much! The home office as of this morning. The mountains were looking a little cold this morning as we had one of our infrequent snowfalls here in the city. I have to admit - I do have a little discomfort. As with most Vancouver homes, insulation seems a little lacking. Paul - can I borrow some of yours? I'm off to scrape the ice off of the sidewalks and watch the area drivers slide down the hills like they do in Portland. Sconces? Bonsai trees? What's next, aromatherapy? That's not an office, it's a spa!